As mentioned in our previous posts, Ava's third and final favorite destination this past summer has been Preston, Idaho. 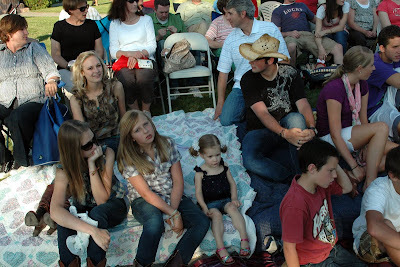 One of our favorite family traditions is attending That Famous Preston Night Rodeo. It is held annually during the last weekend in July. This year, Larry was on business in Costa Rica and was very sad to have missed the rodeo and all of the fun rodeo festivities. So, Ava and I headed up to Preston with Granny O and Freddy O a couple of days early to start the fun. 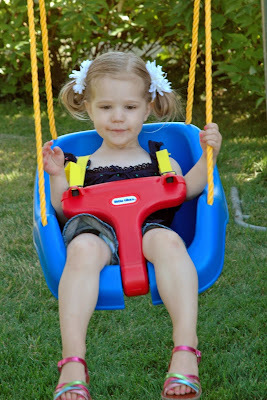 When we first got to Granny O's "farm" (it is not really a farm, Ava just associates Granny O's house with my grandparents farm), Ava wanted to get on the swings right away. She loves to swing very high and very fast. 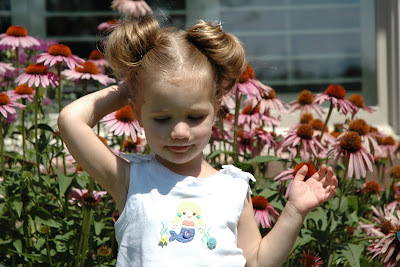 She says she is just like a "bird." Before the rodeo, there is always the rodeo parade. This has always been one of my favorite parades. You would not believe the amount of candy that gets thrown to the parade watchers. I remember as a child going back to my grandparents house with a huge sack of candy following the parade. Now it is fun to watch as all of my nephews and nieces get so excited as they gather their candy. 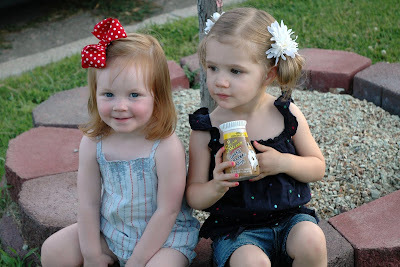 Ava, not a big candy fan, was super excited when the chocolate milk truck came by. They always give out the best chocolate and strawberry milk. Chocolate milk, which Ava refers to as a "shake", is one of Ava's very favorite things and will always bring a smile to her face. Following the parade, Ava took a rest with her fun cousin Sophie. 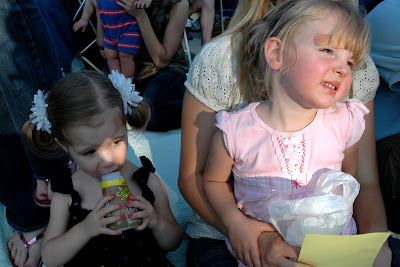 Ava was holding tight to her third chocolate milk, which she had deviously scored from somebody. Ava, Sophie, and Annissa were too little to go to the actual rodeo, so they headed back to Granny and Freddy O's Idaho house. 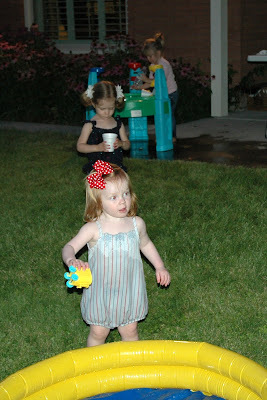 It was perfect weather and the little girls had so much fun staying up late and playing with the water table. 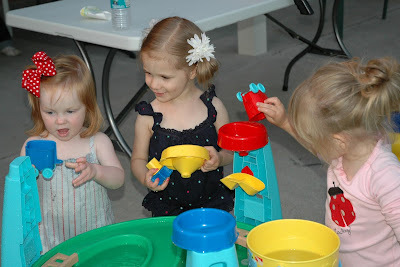 After playing for awhile at the table, they decided that they wanted to go swimming and determined to fill up the swimming pool one cup (or train) at a time. The next morning we headed off to church. 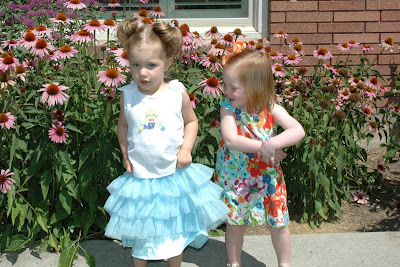 Here Ava and Sophie pose for a picture. Ava was very excited to wear her favorite mermaid shirt and her "fin" skirt. She had spotted it at the mall several days earlier and had to have it. Unfortunately, they only had a size 4. She was adamant about wearing it anyway, thus requiring her to hold it up much of the day. You are inspiring me to get back blogging, myself! I'm so glad that you did a post from July! I am very, very, very behind, but it is so fun to see pictures of the cousins together! Thanks for posting the rodeo!